TraDIS analysis of GAS gene fitness in NHP necrotizing myositis. Complexity of the (A) M1 GAS mutant pools and (B) M28 GAS mutant pools before and after a 24-hour experimental NHP infection. 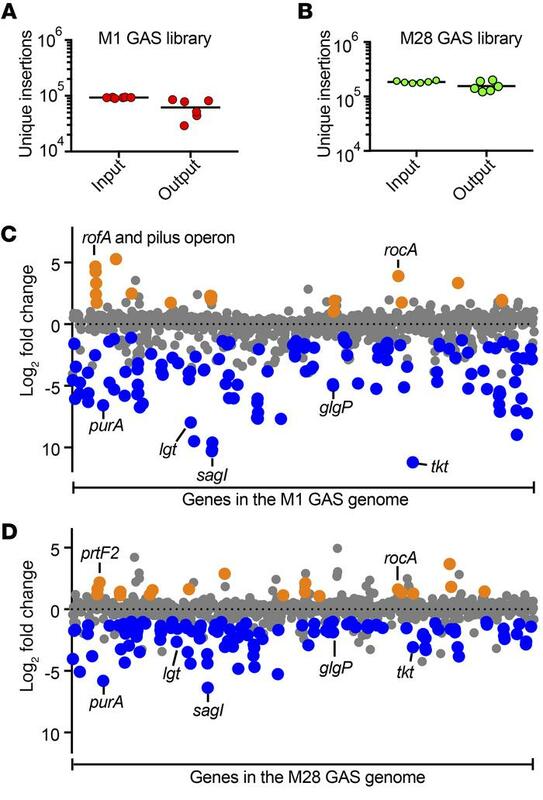 Genome-scale summary of the changes in mutant abundance (y axis) for each of the genes (x axis) in the (C) M1 GAS output pools and (D) M28 GAS output pools. Gene mutations (insertions) conferring significantly decreased (blue dots) or increased (orange dots) fitness are highlighted. Dots representing the gene mutations conferring significantly changed fitness are enlarged for visual emphasis.